This book presents a new interpretation of the development of the French army during the "personal rule" of Louis XIV. Based on massive archival research, it examines the army not only as a military institution but also as a political, social and economic organism. 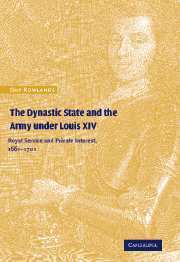 Guy Rowlands asserts that the key to the development of Louis XIV's armed forces was the king's determination to acknowledge and satisfy the military, political, social and cultural aspirations of his officers, and maintain the solid standing of the Bourbon dynasty. General introduction: 'Absolute monarchy', dynasticism and the standing army; Part I. 'Patrimonial Bureaucracy': The Le Tellier Dynasty and the Ministry of War: Introduction; 1. The Secretary of State for War and the dynastic interests of the Le Tellier family; 2. The ebb and flow of Le Tellier power, 1661–1701; 3. The use and abuse of servants: the Ministry of War, venality and civilian power in the army; 4. Financing war: the treasury of the Extraordinaire des guerres; 5. Corruption and the pursuit of self-interest in the Ministry of War; Part II. The Forging of the French Officer Corps and the Standing Army under Louis XIV: Introduction; 6. In the name of sustainability: reforming the structure of the standing army and the officer corps; 7. The business of a regiment; 8. The pressures and temptations of service; Part III. The High Command of the French Armies: Introduction; 9. The commanders-in-chief and the delegation of royal authority; 10. The appointment of general officers; 11. The summits of ambition and the rewards of good service: the bienfaits du roi and the high command; Conclusion: the preservation of the dynasty; Appendix 1: Defining the grands; Appendix 2: The proportion of revenue generated by the Extraordinaire des guerres as a 'primary receiver'; Bibliography. "Rowlands's book is monumental in scope, superbly researched and written, and highly original, overturning many accepted interpretations. It is an impressive tour de force." "Valuable.... Based on solid archival research..."
"In this generally excellent and important study, Guy Rowlands displays a mastery of military administration, monachical practice, and elite society that raises the bar for discussing the state and the army of Louis XIV." "...represents an important contribution to our understanding of seventeenth-centruy France... Rowlands' study of the nuts and bolts of army administration sheds considerable light not only on the history of war, but also on the history of the nobility, of finance, and of the state." "Guy Rowlands has given us an important book, indespensable reading for everyone in the field."